It seemed like a good idea at the time: plop dinner in the crock pot in the morning and make the dinner rolls in the evening when I got home from work. And then I spent all day at work teaching my students in the lab and the unforgiving concrete floors just got to me. My feet, my back, my body just hurt. When the rolls came out of the oven piping hot, I didn’t regret one bit the extra few minutes I stood with my aching body in front of the Kitchenaid mixer kneading the dough. The rolls were delicious and perfect. The dough was easy to work with and made a huge batch of rolls, half of which I froze for later (pre 2nd rise). Place water in your mixing bowl; sprinkle with yeast, and let stand until foamy, about 5 minutes. Whisk in milk, butter, sugar, salt, and 2 eggs to the yeast mixture. With your stand mixer on “stir,”slowly add in 6 cups flour, 1 cup at a time, until you have a soft, shaggy dough (if necessary, add up to 1/2 cup more flour). Knead until smooth and elastic, at least 5 minutes. Butter the inside of a large bowl; place dough in bowl, turning to coat. Cover bowl with plastic wrap; let stand in a warm spot until dough has doubled in size, about 1 1/4 hours. 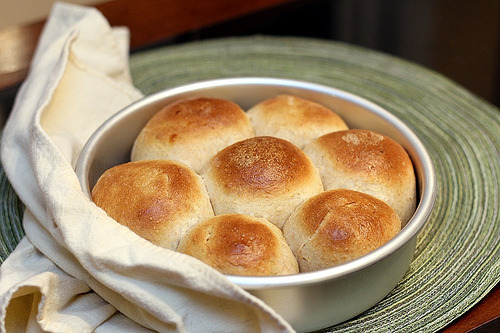 To make small dinner rolls: Butter two 13-by-9-inch baking pans. Divide dough in half. Roll each half into a 15-inch rope; cut each rope into 15 1-inch pieces. Press each piece into a disk, then shape into a ball. Arrange dough balls in prepared pans. (To make ahead: Wrap pans well, and freeze, up to 2 months.) Cover pans loosely with plastic; let stand in a warm spot until rolls have doubled in size, about 1 1/4 hours (2 hours more if frozen). To make larger dinner rolls: Prepare 3 8″ cake pans with butter. Pinch off dough balls just larger than the size of a golf ball and form into a smooth sphere. Place in prepared pans (about 7 should fit). Cover pans loosely with plastic; let stand in a warm spot until rolls have doubled in size, about 1 1/4 hours (2 hours more if frozen). This entry was posted in Brady Evans Venables, Cooking, Food, Recipes and tagged Brady Evans Venables, Columbia, columbia sc, cooking, every woman blog, Famously Hot, food, hospital blog, Lexington, lexington medical center., lexington sc, Lexington Women, lmc, LMC every woman blogger, Midlands, Midlands Women, South Carolina, South Carolina Women, Women, women's blog, women's hospital blog, Yeasted Dinner Rolls by Kate Gillmer. Bookmark the permalink.